Palaces and pagodas, tombs and temples, culture and cuisine, history and heartbreak, there’s no shortage of poetic pairings to describe Hue (pronounced ‘hway’). A Unesco World Heritage site, this deeply evocative capital of the Nguyen emperors still resonates with the glories of imperial Vietnam, even though many of its finest buildings were destroyed during the American War. Hue owes its charm partly to its location on the Perfume River – picturesque on a clear day, atmospheric even in less flattering weather. There’s always restoration work going on to recover Hue’s royal splendour, but today the city is very much a blend of new and old as sleek modern hotels tower over crumbling century-old Citadel walls. The city hosts a huge biennial arts festival, the Festival of Hue (www.huefestival.com), in even-numbered years, featuring local and international artists and performers. Journalist Gavin Young’s 1997 memoir A Wavering Grace is a moving account of his 30-year relationship with a family from Hue and with the city itself, during and beyond the American War. It makes a good literary companion for a stay in the city. Tourism has brought an excess of touts, but, minor hassles aside, Hue remains a tranquil conservative city. There’s no real bar scene and local tourism authorities have lamented the local bedtime of 10pm. In 1802 Emperor Gia Long founded the Nguyen dynasty, moved the capital from Hanoi to Hue in an effort to unite northern and southern Vietnam, and commenced the building of the Citadel. The city prospered, but its rulers struggled to counter the growing influence of France. In 1885, French forces responded to a Vietnamese attack by storming the Citadel, burning the imperial library and removing every single object of value – from gold ornaments to toothpicks. The emperors continued to reside in Hue, but were very much sidelined from events of national importance. It was only in 1968 that attention shifted to Hue again, during the Tet Offensive. While the Americans concentrated on holding Khe Sanh, North Vietnamese and Viet Cong (VC) forces seized Hue, an audacious assault that commanded headlines across the globe. During the 3½ weeks that the North controlled the Citadel, more than 2500 people were summarily shot, clubbed to death or buried alive. The North called them – ARVN soldiers, wealthy merchants, government workers, monks, priests and intellectuals – ‘lackeys who owed blood debts’. The USA and South Vietnamese responded by levelling whole neighbourhoods, battering the Citadel and even using napalm on the imperial palace. Approximately 10,000 people died in Hue, including thousands of VC troops, 400 South Vietnamese soldiers and 150 US Marines – but most of those killed were civilians. Most of Hue’s principal sights (and a sizeable chunk of its population) reside within the moats of its Citadel, including the Imperial Enclosure. Other museums and pagodas are dotted around the city. All the principal royal tombs are some distance south of Hue. 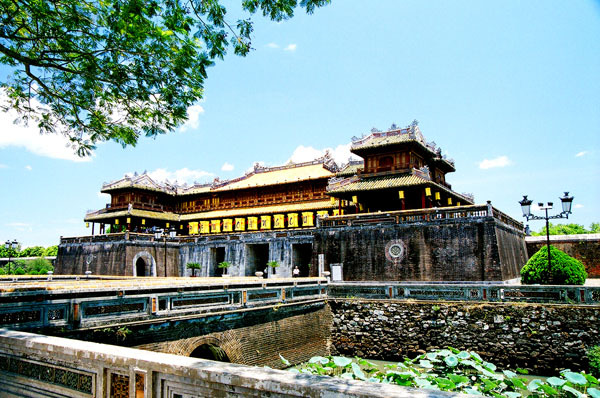 Built between 1804 and 1833, the Citadel (Kinh Thanh) is still the heart of Hue. Heavily fortified, it consists of 2m-thick, 10km-long walls, a moat (30m across and 4m deep), and 10 gateways. The Citadel has distinct sections. 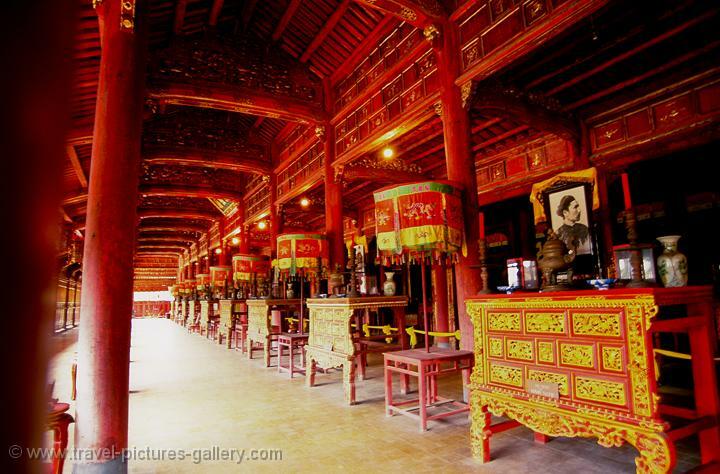 The Imperial Enclosure and Forbidden Purple City formed the epicentre of Vietnamese royal life. On the southwestern side were temple compounds. There were residences in the northwest, gardens in the northeast and in the north the Mang Ca Fortress (still a military base). We’ve organised the sights inside the Imperial Enclosure as you’ll encounter them inside the compound, beginning at the Ngo Mon Gate entrance and moving anticlockwise around the enclosure. (admission 105,000d; 7am-5.30pm) The Imperial Enclosure is a citadel-within-a-citadel, housing the emperor’s residence, temples and palaces and the main buildings of state within 6m-high, 2.5km-long walls. Today much of it is in ruins. What’s left is only a fraction of the original – the enclosure was badly bombed during the French and American wars, and only 20 of its 148 buildings survived. Restoration and reconstruction of damaged buildings is ongoing. This is a fascinating site, worth exploring for half a day. However, as there’s only very limited information available (some in English and French) and signage is very poor, it’s difficult to know exactly where you are at times. Expect a lot of broken masonry, rubble, cracked tiling and weeds as you work your way around. Nevertheless it’s enjoyable as a leisurely stroll and some of the less-visited areas are highly atmospheric. There are little cafes and souvenir stands dotted around. The principal entrance to the Imperial Enclosure is Ngo Mon Gate, which faces the Flag Tower. The central passageway with its yellow doors was reserved for the use of the emperor, as was the bridge across the lotus pond. Others had to use the gates to either side and the paths around the pond. On top of the gate is Ngu Phung (Belvedere of the Five Phoenixes); on its upper level is a huge drum and bell. The emperor appeared here on important occasions, most notably for the promulgation of the lunar calendar. On 30 August 1945, the Nguyen dynasty ended here when Emperor Bao Dai abdicated to a delegation sent by Ho Chi Minh. This palace (Palace of Supreme Harmony; 1803) is a spacious hall with an ornate timber roof supported by 80 carved and lacquered columns. It was used for the emperor’s official receptions and important ceremonies. On state occasions the emperor sat on his elevated throne, facing visitors entering via the Ngo Mon Gate. No photos are permitted, but be sure to see the impressive audio-visual display, which gives an excellent overview of the entire Citadel, its architecture and the historical context. Located immediately behind Thai Hoa Palace on either side of a courtyard, these halls were used by mandarins as offices and to prepare for court ceremonies. The hall to the left has been set up for cheesy tourist photos where you can pose in imperial costume on a throne. The opposite hall showcases some fascinating old photographs (including boy-king Vua Duya Tan’s coronation), gilded Buddha statues and assorted imperial curios. Behind the courtyard are the ruins of the Can Chanh Palace, where two wonderful long galleries, painted in gleaming scarlet lacquer have been reconstructed. (Thai Binh Lau) The exquisite (though crumbling) little two-storey Emperor’s Reading Room was the only part of the Forbidden Purple City to escape damage during the French reoccupation of Hue in 1947. It’s currently being renovated and is not open to visitors, but it’s worth checking out the Gaudi-esque roof mosaics. (Duyen Thi Duong; 351 4989; www.nhanhac.com.vn; tickets 70,000d; performances 9am, 10am, 2.30pm & 3.30pm) The Royal Theatre, begun in 1826 and later home to the National Conservatory of Music, has been rebuilt on its former foundations. Cultural performances here last 30 minutes. Southeast of here almost nothing remains of the Thai To Mieu temple complex (it’s now a plant nursery) and former University of Arts. Occupying the northeast corner of the Imperial Enclosure, these delightful gardens were developed by the first four emperors of the Nguyen dynasty but fell into disrepair. They’ve been beautifully re-created in the last few years, and are dotted with little gazebo-style pavilions (one a cafe) and ponds. This is one of the most peaceful spots in the entire Citadel. (Tu Cam Thanh) In the very centre of the Imperial Enclosure, there’s almost nothing left of the once-magnificent Forbidden Purple City. This was a citadel-within-a-citadel-within-a-citadel and reserved solely for the personal use of the emperor – the only servants allowed into this compound were eunuchs who would pose no threat to the royal concubines. The Forbidden Purple City was almost entirely destroyed in the wars, and its crumbling remains are now overgrown with weeds. In 1844 Emperor Thieu Tri described this as one of the most beautiful spots in Hue, but it was utterly devastated by war. Check out the imposing entrance gate complete with prancing dragons and phoenixes, and the oval moat. The exterior has been impressively restored, while the interior remains empty except for its elaborate columns and tiles. The stunning, partially ruined Dien Tho Residence (1804) once comprised the apartments and audience hall of the Queen Mothers of the Nguyen dynasty. The audience hall houses an exhibition of photos illustrating its former use, and there is a display of embroidered royal garments. Just outside is an enchanting pleasure pavilion, a carved wooden building set above a lily pond. This has now been transformed into a delightful little cafe. Taking up the southwest corner of the Imperial Enclosure, this highly impressive walled complex has been beautifully restored. The imposing three-tiered Hien Lam Pavilion sits on the south side of the complex, it dates from 1824. On the other side of a courtyard is the solemn To Mieu Temple, housing shrines to each of the emperors, topped by their photos. Between these two temples are Nine Dynastic Urns (dinh), cast between 1835 and 1836, each dedicated to one Nguyen sovereign. About 2m in height and weighing 1900kg to 2600kg each, the urns symbolise the power and stability of the Nguyen throne. The central urn, also the largest and most ornate, is dedicated to dynasty founder Gia Long. Also in the courtyard are two dragons, trapped in what look like red phone boxes. On the north side of the complex, a gate leads into a small walled enclosure that houses the Hung To Mieu Temple, a reconstruction of the 1804 original, built to honour Gia Long’s parents. Located just inside the Citadel ramparts, near the gates to either side of the Flag Tower, are the Nine Holy Cannons (1804), symbolic protectors of the palace and kingdom. Commissioned by Emperor Gia Long, they were never intended to be fired. Each brass cannon is 5m long and weighs about 10 tonnes. 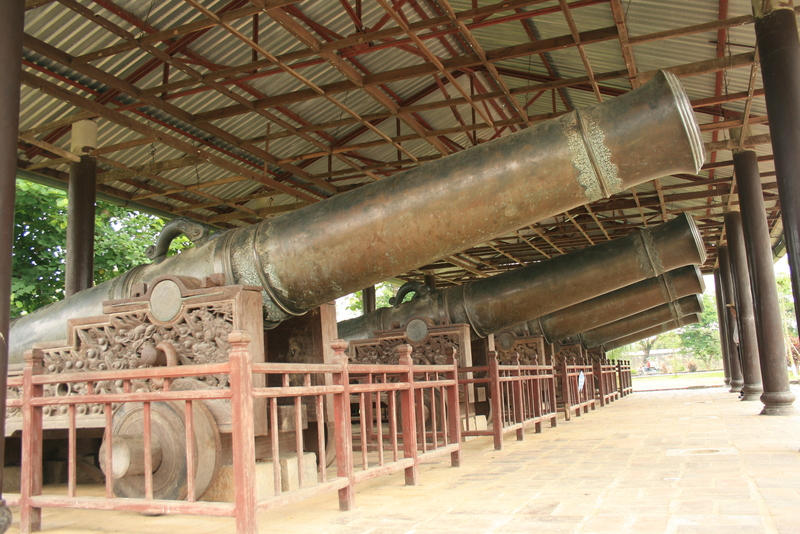 The four cannons near Ngan Gate represent the four seasons, while the five cannons next to Quang Duc Gate represent the five elements: metal, wood, water, fire and earth. (Quoc Tu Dieu De; 102 Ð Bach Dang) Overlooking Dong Ba Canal, this pagoda was built under Emperor Thieu Tri’s rule (1841–47) and is famous for its four low towers, one to either side of the gate and two flanking the sanctuary. Dieu De was a stronghold of Buddhist and student opposition to the South Vietnamese government and the American War and many arrests were made here when police stormed the building in 1966. The pavilions on either side of the main sanctuary entrance contain the 18 La Ha, whose rank is just below that of Bodhisattva, and the eight Kim Cang, protectors of Buddha. In the back row of the main dais is Thich Ca Buddha, flanked by two assistants. (150 Ð Nguyen Hue; 6.30am-5.30pm summer, 7am-5pm winter) This recently renovated museum is located in the baroque-influenced An Dinh Palace, commissioned by Emperor Khai Dinh in 1918 and full of elaborate murals, floral motifs and trompe lœil details. Emperor Bao Dai lived here with his family after abdicating in 1945. Inside you’ll find some outstanding ceramics, paintings, furniture, silverware, porcelain and royal clothing, though information is a little lacking. (Ham Long Hill) Founded in 1670, this hilltop pagoda is on the southern bank of the Perfume River and has a striking triple-gated entrance reached via a wide staircase. On the right is a centre for training monks, which has been functioning since 1940. To get here, head south from Ð Le Loi on Ð Dien Bien Phu and take the first right after crossing the railway tracks. (Ð 23 Thang 8; 7-11am & 1.30-4.30pm Tue-Sun) Formerly a school for princes and the sons of high-ranking mandarins, this slightly rundown complex has a pagoda devoted to archaeology, a small Natural History Museum and a building with exhibitions about anticolonial resistance. (Truong Quoc Hoc; 10 Ð Le Loi; 11.30am-1pm & from 5pm) One of the most famous secondary schools in Vietnam, the National School was founded in 1896. Its former pupils include General Vo Nguyen Giap and Ho Chi Minh (who attended for a year in 1908). You can visit the school during lunch break and after classes finish. (7 Ð Le Loi; 7-11am & 1.30-4pm Tue-Sun) The father of the modern Vietnamese nation spent 10 years in Hue, and you’ll find some intriguing photographs as well as a collection of certificates and medals here. There’s very little information in English though. (Ð Dien Tien Hoang) An island on Tang Tau Lake, which is northeast of Tinh Tam Lake, was once the site of a royal library. 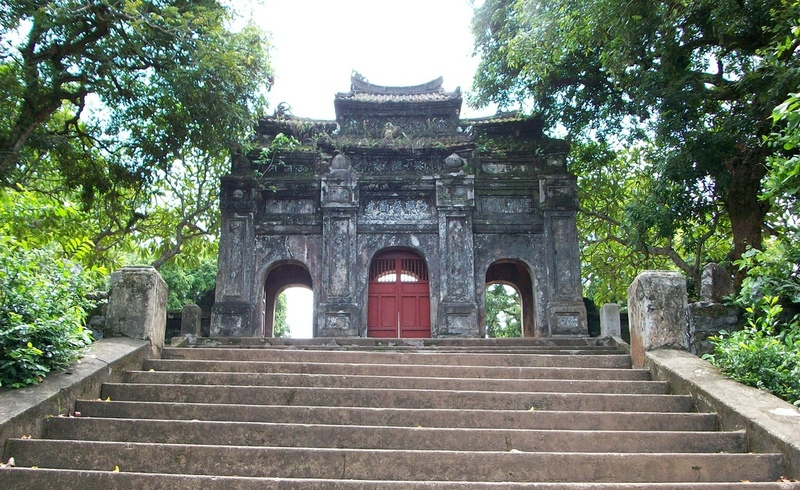 It is now occupied by the small Ngoc Huong Pagoda. Behind the main sanctuary of the Thien Mu Pagoda is the Austin motorcar that transported the monk Thich Quang Duc to the site of his 1963 self-immolation. He publicly burned himself to death in Saigon to protest against the policies of South Vietnamese President Ngo Dinh Diem. A famous photograph of this act was printed on the front pages of newspapers around the world, and his death inspired a number of other self-immolations. The response of the president’s notorious sister-in-law, Tran Le Xuan (Madame Nhu), was to crassly proclaim the self-immolations a ‘barbecue party’, saying ‘Let them burn and we shall clap our hands’. Her statements greatly aggravated the already substantial public disgust with Diem’s regime. In November both President Diem and his brother Ngo Dinh Nhu (Madame Nhu’s husband) were assassinated by Diem’s military. Madame Nhu was overseas at the time. Another self-immolation sparked fresh protest in 1993. A man arrived at the pagoda and, after leaving offerings, set himself alight chanting the word ‘Buddha’. Although his motivation remains a mystery, this set off a chain of events whereby the pagoda’s leading monks were arrested and linked with the independent United Buddhists of Vietnam, the banned alternative to the state-sanctioned Vietnam Buddhists. This led to an official complaint to the UN by the International Federation of Human Rights accusing the Vietnamese government of violating its own constitution, which protects freedom of religion. (054-382 7051; www.stopandgo-hue.com; 3 Ð Hung Vuong) Personalised motorbike and car tours. A full-day DMZ car tour guided by a Vietnamese vet costs US$27 per person for four people, representing a good deal. Guided trips to Hoi An stopping at beaches are also recommended. ( 054-383 2241; [email protected]; 10/2 Ð Nguyen Tri Phuong) Inexpensive cycle, motorcycle (from US$10 per person) and car tours (DMZ from US$40 per person) around Hue and beyond, run by Minh, who is a great character. Hue offers great value for money: rates are well below those in the capital or HCMC. The main tourist enclave is centred on the lanes between Ð Le Loi and Ð Vo Thi Sau. ( 054-625 2171; www.hueninohotel.com; 14 Ð Nguyen Cong Tru; r US$14-24) Family-owned, this warm, welcoming guesthouse has an artistic flavour with stylish furniture, artwork and smallish rooms with minibar, cable TV and good-quality beds. A generous breakfast is included. ( 054-393 8849; http://jadehotelhue.com; 17 Nguyen Thai Hoc; r US$15-25) You’ll find simply excellent service standards at this fine place; staff are very sweet and welcoming indeed. Rooms enjoy soft comfy mattresses and there’s a nice lobby-lounge for hanging out. ( 054-383 1358; http://starcityhotelhue.com; 2/36 Vo Thi Sau; r US$12) Offering really cheap rates, this five-storey hotel has a lift, and clean, spacious rooms all with TV and air-con. It’s set off the street so traffic noise isn’t an issue. (054-382 6567; www.vietnambackpackerhostels.com; 10 Ð Pham Ngu Lao; dm US$8-12, r US$18) Backpackers’ mecca thanks to its central location, eager-to-please staff, good info and sociable bar-restaurant. Dorms (some with queen-sized beds) are well designed and have air-con and lockers. ( 054-382 1068; [email protected]; 20 Ð Hung Vuong; r US$11-17) Nine spacious rooms with cable TV and attractive bathrooms, and the location is convenient, although it’s on a busy road. There’s a restaurant that’s very popular with travellers here too. ( 054-388 3793; www.huethuonghotel.com; 11 Ð Chu Van An; r US$15-22) A great little minihotel, where the rooms, though smallish, have a real sparkle and are very well presented – all come with purple and white linen and attractive furniture. (054-393 5589; [email protected]; 17 Ð Chu Van An; r US$14-16) If you ignore the off-putting overdose of tour advertising in the lobby, this is not a bad choice. Rooms are spacious with good beds, minibar and TV. (054-382 5526; www.binhminhhue.com; 36 Ð Nguyen Tri Phuong; r US$15-35) A six- storey hotel that offers a central location, pleasant staff and fair-sized rooms; a little dated in appearance but some have a balcony. Budget options exclude air-con and breakfast. (054-397 9797; www.moonlighthue.com; 20 Pham Ngu Lao; r US$44-65, ste US$70-140) A ‘new generation’ Hue hotel where the rooms boast a very high spec for the modest bucks charged, all with polished wooden floors, marble-clad bathrooms (with tubs) and lavish furnishings. Pay a bit more for a balcony with a Perfume River view. Breakfast is great but the pool area is small and covered. (054-383 1177; www.orchidhotel.com.vn; 30A Ð Chu Van An; r US$30-75) This is a very well-run modern hotel rightly renowned for its warm service; staff really make an effort here. The accommodation is excellent, all options have laminate flooring, bright scatter cushions and a DVD player, while some pricier rooms even have a jacuzzi with city views. Your complimentary breakfast is good (eggs are cooked to order) and children are well looked after. (054-381 4815; www.goldhotelhue.com; 28 Ð Ba Trieu; r US$35-42, ste US$60-80) Impressive new hotel a short walk or cyclo (pedicab) ride from the river. It has a main restaurant area and immaculately presented modern rooms with superb bathrooms (all have tubs). It’s efficiently run and excellent value, though the pool area is a bit of an after thought. (054-381 9845; http://hueholidaydiamondhotel.com; 6, 14 Nguyen Cong Tru; r US$24-30, f US$36) Book ahead as it extremely popular, and it’s easy to understand why as the friendly, attentive and helpful staff really make the place. Rooms are fine value and breakfast is included. (054-393 6688; http://muongthanh.vn; 38 Ð Le Loi; r from US$64) Formerly the Mercure, this hotel soars above the Perfume River in a prime location and has rooms with polished wood furnishings, hip bathrooms, balconies and all mod cons. The kidney-shaped pool is smallish though, and service could be a little sharper. (054-382 7561; www.thaibinhhotel-hue.com; 2 Ð Luong The Vinh; r US$20-35) One street away from the tourist thoroughfare, this powder-blue hotel is near to the action, yet quiet. Views from the higher floors are excellent, staff are pretty efficient and there’s a restaurant (meals from US$3). (054-388 5461; www.pilgrimagevillage.com; 130 Ð Minh Mang; r/bungalows from US$110/153) Designed around a verdant valley that includes a 40m pool, lotus ponds and a state-of-the-art spa and yoga space, this feels more like a Zen ecoretreat than a hotel. Rooms are all supremely comfortable, but for the ultimate experience book one of the bungalows with private plunge pool. There’s a fine restaurant, lovely breakfast room and bar. Located about 3km from the centre of Hue. Check their website for promotions that cut rates to below US$90, a real steal. (054-383 7475; www.la-residence-hue.com; 5 Ð Le Loi; r from US$155) Once the French governor’s residence, this wonderful hotel resonates with art-deco class, with its original features and period detailing. A frangipani-lined path leads down to the 30m pool, from where you can gaze over the Perfume River. Rooms are sumptuously appointed, the restaurants are excellent, and service is polished and professional. (054-382 3526; www.morinhotel.com.vn; 30 Ð Le Loi; r/ste from US$118/236) Built in 1901, this was the first hotel in central Vietnam and once the hub of French colonial life in Hue. The building is very classy, with accommodation set around two inner courtyards and a small pool. Rooms are grand and beautifully presented, with plush carpets and period detail that evoke a real ‘wow’ factor. Many sights around Hue, including Thien Mu Pagoda and several of the Royal Tombs, can be reached by boat via the Perfume River. Most hotels and travellers’ cafes offer shared tours hitting the main sights (from as little as US$4 to around US$18 per person). These tours usually run from 8am to 4pm. There are many different itineraries; some of the better ones start with a morning river cruise, stopping at pagodas and temples, then after lunch you transfer to a minibus to hit the main tombs and then return to Hue by road. On the cheaper options you’ll often have to hire a motorbike to get from the moorings to the tombs, or walk (in the intense heat of the day). If you ask at the moorings on the south side of the river you can theorectically negotiate your own route. Rates for chartering a boat start at US$7 or so for an hour’s cruise up the river. However, be warned that boats are slow. Reckon on a full day to visit some of the more impressive, distant tombs. Be clear on your requirements, preferably in writing. We have the famed fussy eater Emperor Tu Duc to thank for the culinary variety of Hue, and an imperial cuisine banquet is usually a memorable experience. Royal rice cakes, the most common of which are banh khoai, are worth seeking out. You’ll find these along with other variations (banh beo, banh loc, banh it and banh nam) in street stalls and restaurants at Dong Ba Market and around town. Vegetarian food has a long tradition in Hue. Stalls in Dong Ba Market serve lots of options on the first and 15th days of the lunar month. (3 Ð Le Quy Don; meals 30,000-55,000d; 11am-9.30pm) No nonsense, very local Viet vegie restaurant renowned for providing filling food at rock-bottom rates. Fresh banh beo (steamed rice pancakes), noodle dishes, crispy fried jackfruit and aubergine with ginger all deliver. The menu has very rough English translations to help you order (staff speak little or no English). (34 Ð Tran Cao Van; meals 60,000-140,000d; 11.30am-9.30pm) An authentic Japanese restaurant with tasteful furnishings (including lanterns, calligraphy wall hangings and even fake cherry blossom) and a winsome menu that takes in sushi, tempura and yakitori dishes. (14 Ð Nguyen Cong Tru; meals from 35,000-80,000d; 7am-9.30pm) Ideal for pasta, a sandwich, baguette or homemade cake (baked on the premises), this likeable little cafe employs disadvantaged youths and graduates of the ACWP (Aid to Children Without Parents) training program. Food is MSG-free. (054-382 1281; 24 Ð Trần Cao Vân; mains from 26,000đ) Owner-photographer Mr Cu, whose inspirational pictures adorn the walls, has been hosting backpackers here for years, and his relaxed restaurant has lots of vegetarian and breakfast choices. Also operates as a tour agency. (054-382 5146; 12 Ð Chu Van An; dishes US$1.50-9; 6-9pm) This simple little place offers all your usual Japanese favourites (including teriyaki and udon and soba noodles). The restaurant might be lacking a little in ambience, but it does employ former street children and supports a home for them. (Ð Ba Trieu; bowl 40,000d; 6am-10.30am) This breakfast street kitchen serves up bun bo hue (Hue-style rice noodle soup) which is accompanied by a caveman-sized hunk of pork or beef, shredded banana flower and chilli. (3 Ð Hung Vuong; meals 20,000-60,000d; 7am-10pm) Atmospheric little place with decent Vietnamese and backpacker fare: banh beo, beef noodle soup, tacos, pizza and pasta, and filling Western breakfasts. It’s worth dropping by for the excellent travel information. (38 Ð Le Thanh Ton; meals 20,000-35,000d; 10.30am-8pm) A simple courtyard place serving delicious and very cheap barbecued pork kebabs, served with noodles and vegetables. (054-382 6928; www.littleitalyhue.com; 2A Ð Vo Thi Sau; mains 45,000-115,000d; 7am-10pm) Large trattoria with a decent line-up of Italian favourites (pasta, calzone, pizzas and seafood), a wide choice of beers and a palatable Sicilian house wine. ( 054-381 0491; www.lacarambole.com; 19 Ð Pham Ngu Lao; meals 85,000-280,000d; 7am-11pm; ) Run by an affable Frenchman and his Vietnamese partner, this restaurant offers reliable European and local cuisine, including imperial -style Hue specialities. ( 054-382 1616; www.omarkhayyamhue.com; 34 Ð Nguyen Tri Phuong; mains 48,000-170,000d; noon-10pm) If you’re after a spice fix, this Indian has curries, samosas and vegie dishes. They use imported Australian lamb for their full-flavour rogan josh, or order a thali (from 145,000d) for a real treat. (054-384 7143; 27 Ð Chu Van An; dishes 25,000-160,000d) This place has tables set under thatched shelters in a pretty, fecund tropical garden. The cuisine is good, featuring many central Vietnamese specialities, though prepare yourself for the live band (7pm to 9pm nightly) and its popularity with tour groups. (054-354 8815; www.lesjardinsdelacarambole.com; 32 Đặng Trần Côn; meals US$12-30; 7am-11pm) Ạ memorable dining experience, this incredibly classy and refined French restaurant occupies a gorgeous colonial-style building in the Citadel quarter. The menu majors in Gallic classics, there’s a lengthy wine list and informed service. It’s just the place for romantic meal – arrive by cyclo and it’s easy to roll back the years to Indochine times. (Ð Chu Van An; 5pm-late) The most popular late-night bar in town, with a good blend of locals and traveller-revellers and a party vibe. DJs drive the dance floor with r ‘n’ b, hip hop and house music anthems, and staff rally the troops with free shots. It’s open ‘till the last one passes out’. (www.dmz.com.vn; 60 Ð Le Loi; 7am-1am; ) Ever-popular riverside bar with a free pool table, cold Huda beer, cocktails (try a watermelon mojito) and a good craic most nights. Also serves Western and local food till midnight, smoothies and juices. Happy hour is 3pm till 8pm. (10/2 Ð Nguyen Tri Phuong; 6.30am-11pm; ) Hole-in-the-wall bar par excellence. Graffiti-splattered walls, a sociable vibe and good info from the feisty owner, Thu, and her family. They also offer good tours, serve cheap grub and have books and mags to browse. (10 Ð Pham Ngu Lao; 6am-11pm; ) There’s always a buzz about this backpackers’ drinking den, which packs ’em in with its infused vodkas, cocktail list and happy hour (8pm to 9pm). A good bet for the footy, or big sporting events. (23 Ð Vo Thi Sau; tea 40,000d; 8am-6pm) Attached to a fair-trade shop, this little place specialises in Vietnamese tea (including jasmine, ginger and olong) but they’ll also rustle up a coffee if you so desire. Delicious complimentary snacks are served with your drink. (21 Ð Vo Thi Sau) This place has a more relaxed vibe than some other bars in town, a sensational list of cocktails and a popular street terrace. Hue produces the finest conical hats in Vietnam. The city’s speciality is ‘poem hats’, which, when held up to the light, reveal shadowy scenes of daily life. It’s also known for its rice paper and silk paintings. (054-383 3694; www.hwhshop.com; 23 Ð Vo Thi Sau; 8am-6pm) Generating cash from trash, this store stocks lovely handicrafts – such as quirky bags from plastic, and picture frames from recycled beer cans – made by artists with disabilities. Profits aid heart surgery for children in need. (43 Vo Thi Sau; 7.30am-6.30pm) Well-regarded antiques store selling stonework, ceramics, laquerware and wooden carvings. (Ð Tran Hung Dao; 6.30am-8pm) Just north of Trang Tien Bridge, this is Hue’s largest market, selling anything and everything. (6 Ð Tran Hung Dao; 8am-10pm) A small shopping centre between Trang Tien Bridge and Dong Ba Market with a Coopmart supermarket. Virtually every hotel and guesthouse in town has wi-fi, as do many cafes and restaurants. There are internet cafes on the tourist strips of Ð Hung Vuong and Ð Le Loi. Vietcombank (30 Ð Le Loi; Mon-Sat 7.30am-3.30pm) Located at the Hotel Saigon Morin. Most of the travel agencies and tour operators pool clients on their budget tours, so no matter who you book a (standard) DMZ tour with you’re likely to end up on a large bus with other tourists. Of course, more specialist, bespoke trips are available but cost far more. DMZ Travel (054-224 1904; www.dmz.com.vn) All kinds of tours are offered: budget-priced boat trips along the Perfume River (150,000d), DMZ tours (350,000d) and Phong Nha including Paradise cave (580,000d). Bus tickets to Laos are also sold. Mandarin Café (054-382 1281; www.mrcumandarin.com; 24 Ð Tran Cao Van) Mr Cu (who speaks English and French) offers great information, transport and tours to most places in the Hue region, and beyond. Sinh Tourist (054-382 3309; 7 Ð Nguyen Tri Phuong) Books open-tour buses and buses to Laos. Vietnam Airlines (054-382 4709; 23 Ð Nguyen Van Cu; closed Sun) has two daily flights to both Hanoi and HCMC. VietJet also connects Hue daily with the capital and HCMC. The main bus station, 4km southeast of the centre, has connections to Danang and south to HCMC. An Hoa bus station (Hwy 1), northwest of the Citadel, serves northern destinations, including Dong Ha (44,000d, two hours, every 30 minutes). One daily bus at 11.15am (look for ‘Phuc Vu’ in the windscreen) heads for Phong Nha Farmstay and Son Trach (150,000d, four hours). There’s also a useful minibus connection (500,000d, five hours) between Hue Backpackers and Phong Nha Farmstay/Son Trach village, leaving the hostel in Hue at 1pm and stopping at the Vinh Moc Tunnels and the Ben Hai River museum. Entrance tickets and a tour guide at the tunnels are included. Hue is a regular stop on open-tour bus routes. Most drop off and pick up passengers at central hotels. Expect some hassle from persistent hotel touts when you arrive. Mandarin, Sinh and Stop & Go Café can arrange bookings for buses to Savannakhet, Laos. The Hue train station (054-382 2175; 2 Ð Phan Chu Trinh) is at the southwestern end of Ð Le Loi. Hue’s recently upgraded Phu Bai Airport is 14km south of the city. Metered taxis meet all flights and cost about 190,000d to the centre, or use the minibus service for 50,000d. Vietnam Airlines also runs an airport shuttle, which can collect you from your hotel (tickets 60,000d). Pedal power is a fun way to tour Hue and the nearby Royal Tombs. Many hotels rent out bicycles for US$1 to US$2 per day. Motorbikes are available from US$5 to US$10. A car with driver costs around US$40 to US$50 per day. For a taxi, try the reliable Mai Linh ( 054-389 8989).